We were so surprised to see Massari at our home today to see our pups. 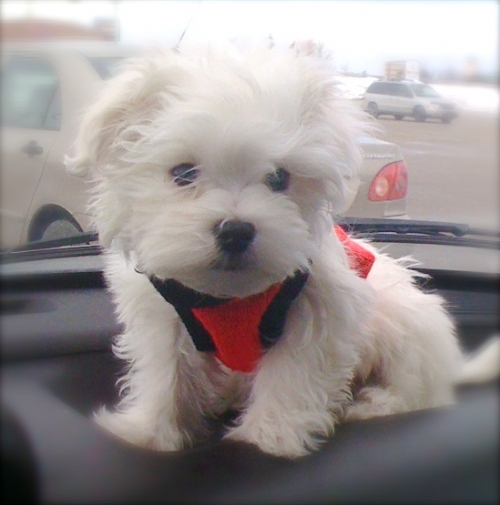 He fell in love with one of our Tiny Toy male Maltese. We already had an update on the pup, just after 2 days of having him Massari already had the little guy pee pad trained! 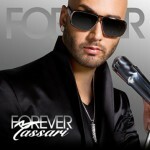 Massari has new singles coming out in January and we can't wait! We wish you best of luck with your career and your new puppy. I am just writing to let you know that baby Edward is doing fine, he eats, sleeps, poos and pees, he never cries not even last night. He woke up at 4:30am and I spent some time with him and he fell back asleep in his basket next to my bed. I covered him with the blanket you gave me and he goes to sleep. Everyone at home loves him and they think he is so cute. Anyways, i will keep you up to date...ttys. 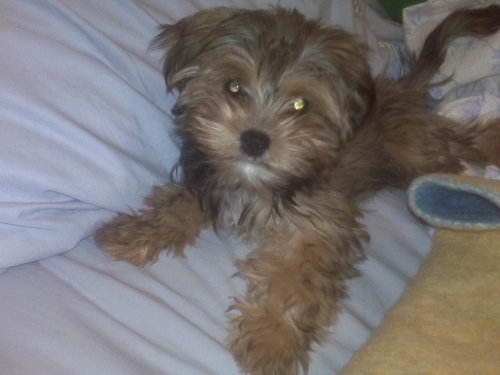 I wanted to send you a new updated pic of Edward he is 3 pounds now. He is healthy and very active. He is alot of fun and he is a little tike! I may want to breed him in the future because he is so cute and he has a great personality. Hope all is good with you and hope to ttys. 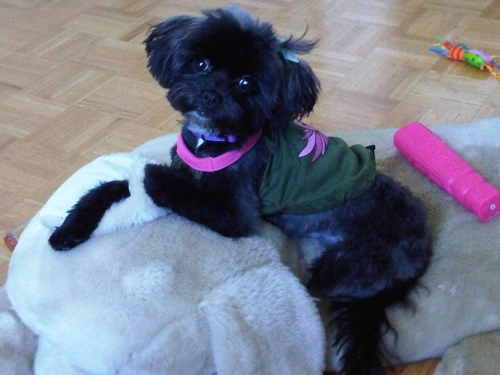 I just wanted to send you some updated pics of our lil Mischa. She's adapting very well to her new home - the lady of the house, as my dad calls her and most definitely the new baby for my mom. Everyone absolutely loves her!!! Thanks so much, she's amazing! Just thought i'd send you a photo of the little trouble maker. I've named him Watson after Dr. Watson in Sherlock Homes. He is doing well. He loves carrots and his veggies. I do give him a little chicken here and there. He is completely pee-pad trained and once it warms up he'll graduate to using my yard as his giant toilet. lol! We were first time dog owners and had NO idea how to care for a dog. A friend told us about John in Georgetown, so we called and asked many questions about different breeds that would fit our lifestyle. We knew what kind of personality and disposition we wanted but had no idea on the different breeds. John suggested we do some research on the Malshi breed, and so we did. A few weeks later we decided to go and take a look and we fell in love with a black and white Malshi who we named Oreo. We are so happy with him, everyone loves him, he's vey social with people and other dogs in the neighbourhood. We couldn't have asked for a better dog. Feb 2nd 2012 - Hey John! Oreo is almost 2 now, we just wanted to send a pic of him all grown up. He is the best dog we have ever had and the whole family loves him. Thanks! We are previously from Georgetown, Ontario and now reside in a small town called Delhi, Ontario. 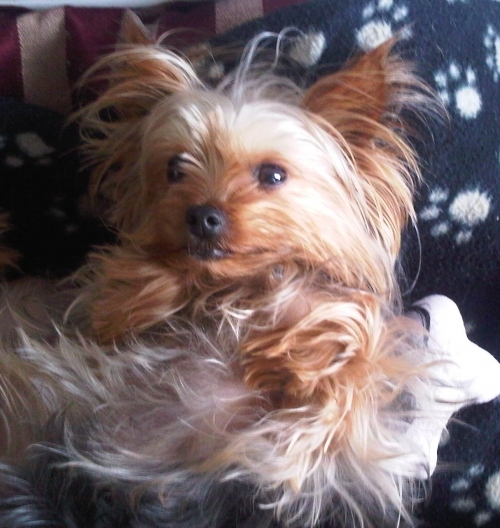 When we first purchased our yorkie 3 years ago and met John, we were so impressed with the beauty and cleanliness of his home and puppies. 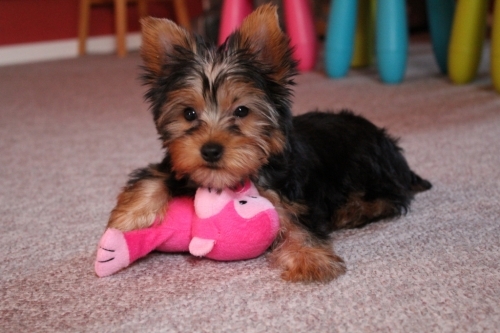 Our little female yorkie named "Ainslie" is 5 pounds and so pretty. She stops traffic all the time! 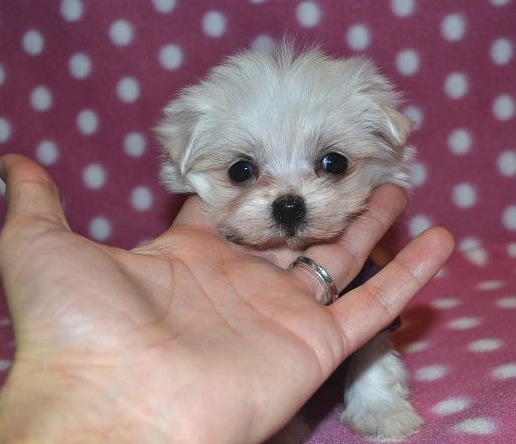 We were so impressed with John's puppies we decided to purchase another one, this time a maltese named "Preston". He is a seven pound handsome young dog, who is very close to his yorkie sidekick. John and I have kept in contact over the years and he always asks about the dogs and how they are doing. John, we cannot thank you enough for our two beautiful, furry family members and your friendship as well. Happy New Years to you and your family, hope you had a great one. 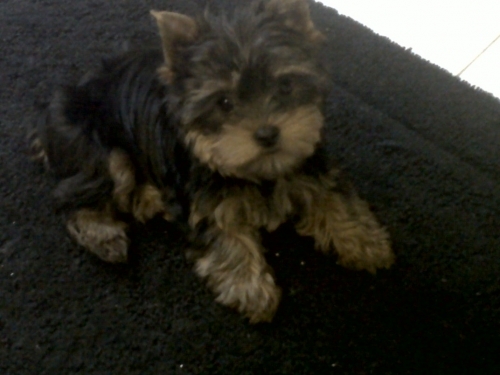 We bought a Teacup female Yorkie from you on Dec 16th. Well, I just wanted to say thank you so much!!! Today I brought her in for her last vaccination shot and she's very healthy and she's doing great. I just wanted to let you know and just wanted to say I am so glad I found you and I was able to find such a wonderful dog. My family and I absolutely love her! So again, I thank you. I was just giving you an update on Bella. She's doing great! Healthy, happy and loving. 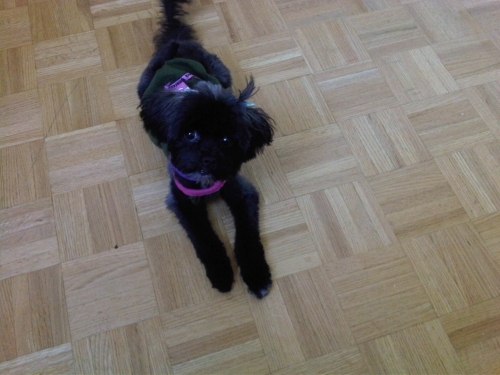 Bella has finally completed all her shots as of May 23rd and sometime this or next month i'm having her fixed. Marlowe is doing great... she started sleeping through the night since i last checked in with you. Can't believe it's been a week since we've brought her home - we love her 🙂 Tomorrow we will start to put out her food for 1 hr in the morning and evening. We gave her a bath today - no problems! First off i just wanted to say thank you so much and it was a pleasure dealing with you. I found John to be extremely helpful as he guided me through the necessary steps to take and consider when owning your first puppy. He is a very knowledgeable and professional individual, you can truly see that he loves what he does. This is someone that i would definitely recommend to all my friends and family when looking to add a new member to their household.